I have arranged your Jabberwocks & other devils in procession according to number & rank, on the piano in the drawing-room, & in that subdued light they take to themselves added atrocities of form & expression, & so make a body's flesh crawl with pleasure. There is a compulsory fascination about them which has drawn me in there every half hour all day; every time I go they look more intelligent, more alive, more suggestive of a convention of Consciences met together to play roots on their poor human proprietors; (see my late Atlantic article.) If I come down at midnight (with my usual dose of hot-Scotch stowed) I shall very easily be able to imagine I see them climbing about the furniture, bearing their rigid tails on high & inspecting everything with their critical brass eyes. I tell you they are different creatures now from what they were this morning. Then, they were desiccated vague imitations of the familiar works of God, & soulless; now, they are real creatures out of Wonderland, secretly alive, natural, proper, & ungrotesque to eyes used to them in the world they came from -- & so they take the fiction all out of the Jabberwock & I recognize & accept him as a fact. You have had a genuine inspiration; you have wrought it out, not lamely, but to perfection. It is the most ingenious thing of this generation. I shall hate to see any of these enchanting monsters go out of the house; they grow so in grotesque grace, hour by hour; & the more of them there are in a group the happier is the effect. Make more--don't leave a root unutilized in Chemung county. But don't go to the last limit--that is, don't breathe actual life into them; for I know (if there is anything in physiognomy & general personal appearance) that they would all vote the Democratic ticket, every devil of them. P.S. These things shan't be fooled away at this fair; they've got to be sold at auction; & I mean to be the auctioneer. 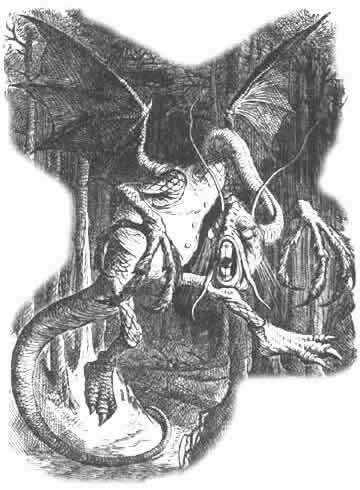 This news article contains no direct quotes but indicates Mark Twain's earlier interest in the Jabberwocky. "The Sale of the Jabberwocks"
The remarkable collection of subterranean creatures, known as the Jabberwocks, now on exhibition at the Union's fair, are to be sold at auction this evening by Mark Twain as auctioneer. They were found underground and recognized almost by accident, it must have been, at first, but now that their identity is made known, they are evidently what they are. Mr. Clemens will explain the history of the "Beamish Boy Galumping Home," afford an opportunity to secure the "Momerath Outgrubing," and the "Slithy Tove upon a Tumtum Tree," and suggest points in the biography of the "Freemious Bandersnatch," and so forth. The Mud March Hare and the Mock Turtle that wept to think it was not a real turtle may also be had for a price.